The Prosecutor General’s Office alleged that the opposition activist was receiving money from abroad to fund his campaign. 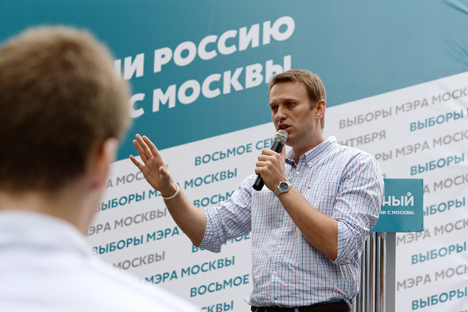 Moscow’s mayoral candidate Alexei Navalny said he did not agree with Prosecutor General’s Office, which claimed to have found a legal violation in the financing of his election campaign from abroad. “Presently, Yandex-Money is being transferred correctly to the account with Sberbank,” he said and demonstrated a sample transaction. “There are plenty of legal comments stating that the use of Yandex-Money for the campaign is absolutely legal,” Navalny said. “But, more importantly, the Moscow Election Commission is checking all received payments. If they are not satisfied with a payment, we return it. So, everyone, please, relax,” Navalny said addressing readers of his blog. A criminal case may be opened. The Prosecutor General’s Office has forwarded the relevant information to the Interior Ministry.